Has anyone heard of the ‘Toyger’ cat breed? I have just come across it and there is a breeder near me. They look so stunning! Their markings were achieved by crossing a Bengal with a Tabby. Definitely on my list for a potential future kitty addition to the family!! Just like a bengal with stripes instead of spots! beautiful. A couple of months ago someone joined the forum with a Toyger. Think he is called Dexter and he is very beautiful. They are very interesting looking. I didn't realize there was bengal in them. I thought they were full tabby, specially bread to bring out the stripe pattern. 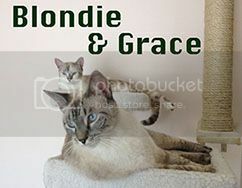 Stunning cat, but how are they registered without both parents being purebred? Can you TICA register a tabby? I don't know. Oops, let me restate. I had heard it was a registration only TICA breed, but apparently it has been advanced to championship level. Which probably means that it has to be a Toyger-Toyger breeding to qualify. So the "tabby" is just the early generation -- just as with the ALC and the tabby creating the bengal. Once you got the bengal/bengal -- it was purebred! I understand now. Sometimes I am just slow. Got to admit I love the idea of these cats but very few appeal to me... The idea of a Tiger looking domestic cat sleeping on my lap would be a dream but most pictures even on the Toyger groups on FB that have joined just look like the local tabbies in my area! I think the breed has a long way to go before I would consider buying one and they are really expensive even just the pet quality ones are over priced. There is a British breeder called Gaynor I think who has some stunning cats and I believe she breeds Bengals also. Right now am just watching from the sidelines and might put my name down for a litter once am satisfied that they look a bit more like a tiger. Right now it can cost up to 3K for a show quality Toyger according to one of the fb groups I had joined. I've been watching the "Cats 101" show on animal planet lately. I set my dvr to record it whenever it comes on (because each show they profile different breeds). The toyger is pretty neat, I guess the goal was just to create a domestic cat that looked as much like a tiger as possible, including the orangey fur color. One of the ones that really fascinated me though as the Savanna! A cross between bengal and oriental shorthair (hmm! ), after many generations they got a big-eared exotic "wildcat" looking sort of awesome cat. Very cool! 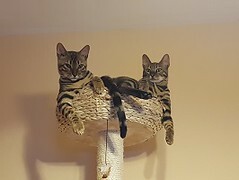 I actually researched Toygers before getting Bengals. At least in Spain they are still very rare and IMO quite expensive, especially for a breed that has way to go yet to look like a tiger. I think the toyger is a gorgeous cat with strikingly sharp stripes. I did research the Toyger, and it's truly stunning. Some sources that there's Bengal blood in it but others don't. But it's very different personality than the Bengal. The Toyger is more calm, quiet and queeny/lazy. What surprised me was that I didn't find anyone attempting to crossbreed the Toyger with Bengal. Statistically, I read there are 20 Toyger breeders in the USA and 15 in the rest of the world. It took me years to find a Bengal to buy here in Saudi Arabia. I'm not sure how many more years before I find a Toyger or Savanah here. PS Did any of you hear a Savanah kitten meow? It's out of this world... very much like aliens. Very adorable yet spooky. The Toyger was bred to resemble a tiger. Thus all the stripes and no spots. They are stunning kitties and very much different in personality from the bengal. They have no wild blood in them. Sherry - if they were bred from a bengal parent they must have *some* wild blood in them, albeit much reduced. There are always breeders using a bengal -- there is one breeder breeding savannahs and bengals. What is that kitten called? I have not researched toygers -- but they certainly have gotten rid of the rosettes from the bengal. And the stripes are just stunning!